So yes, ladies and gentlemen, we present to you that great beacon of liberty, that last bastion of freedom: Brussels! Home of the original Waffle House. Now, I like my waffles (and sprouts) just as much as the next fellow, but Brussels? The capital of the free world? 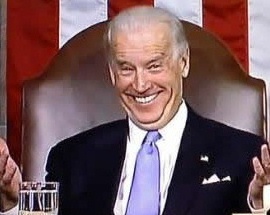 I’ve mentioned Biden’s nuttiness before, but now I’m beginning to think he’s been smoking some of the President’s stash. 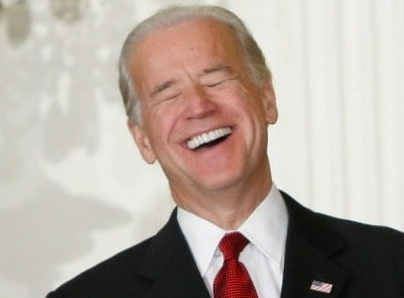 Anyway, next month Biden plans to celebrate that great capital of world culture: Pyongyang, North Korea. Another round of Flemish Red please! 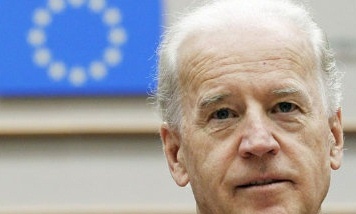 Tags:Belgian Joe, Belgian waffles, Belgium, Bidens EU speech, Brussel Sprouts, Brussels, Brussels Belgium, Brussels Biden, Brussels capital of free world, Brussels home of EU, EU, European Union, Flemish Red, free world, joe biden, North Korea, Pyongyang, vice president, vice president joe biden, vp, Waffle House, Washington D.C.
It’s Tax Day! So, We’re All Paying the IRS Double This Year, Right? I mean, that is basically what Joe Biden said isn’t it? It’s the “patriotic” thing to do, remember? 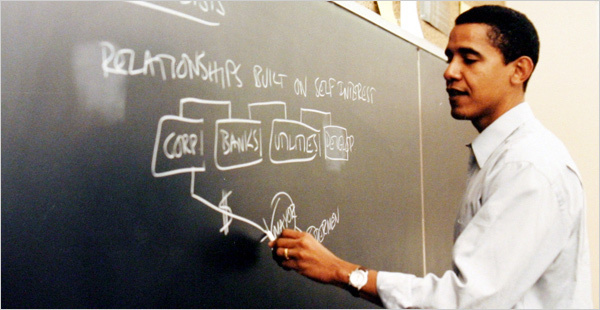 He said that about paying taxes back in 2008 when he and Mr. Obama were running to fundamentally transform America. 1 So to be good patriots, I’m assuming we’re all not only paying our fair share but we’re all going the extra mile this year and paying double what we owe to the federal government. Right? Well, I don’t expect everyone to be patriotic. I certainly don’t expect those Tea Partiers or Republicans or anybody else who didn’t see the wisdom in voting for the Obama-Biden ticket to pay double, or even to pay just a little bit more. Besides, those people are all just racists anyway. I mean, they call Obama bad names like “socialist” so they must be racist, right? 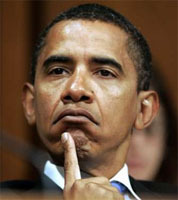 But I am confident that all patriotic Democrats can stand up and proudly say that this year they will be paying… What? What’s that you say? You’re a Democrat and you don’t want to pay double either? But what about what Joe Biden said? I mean, you do agree with your own Vice-President, don’t you? You know, that it’s the patriotic thing to do? Ok, well, how about just 30% more? No? 25% more? 10% more? All right, well forget you guys then. Ok, Liberal Democrats! Here we go! All right, all you Liberal Democrats out there! You guys are the heart and soul of the Democratic Party. The party faithful! Surely, you’d be willing to pony up at least… What? Not even you guys? I mean, c’mon, you guys are liberals! Don’t you practice what you preach? What about government being able to solve all our problems? Help the needy and all that good stuff. C’mon, they’re here to help us and they need your money. The government needs your money! I mean c’mon guys, you’re supposed to be liberals! C’mon! All right, forget you too! "We're from the government and we're here to help." Wait, a news bulletin: The news is reporting on who pays taxes in America. What? 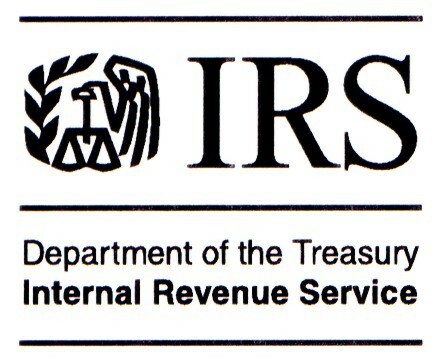 Over 50% of all Americans don’t even pay federal income tax! What? That can’t be! Well, those definitely wouldn’t be Obama supporters, I know that! Because that would be like saying they don’t support what he’s doing with all his big government programs and such. That wouldn’t be patriotic! And that would be hypocrisy. No, I can’t believe that. I won’t believe that, even if it’s true. Ok, but let’s say it is true that over half of all Americans don’t even pay federal income tax. Let’s think about this for a minute. So you’re saying we now have a majority of Americans who can vote for policies that they don’t have to pay for, but that a minority of Americans do have to pay for? Let’s see, is that a good thing for a democracy? Huh. I’m gonna have to think about that one a little more and get back to you. Ok, what about just Democratic members of Congress? Surely, you guys must pay more than your fair share. I mean you vote for this stuff, so you definitely… I mean just to set an example… wait a minute, who am I kidding? Ok, ok, just Joe Biden then. Joe, you’re the one who said paying taxes makes you a patriot, so you must pay way more than… What? Not even you, Joe? 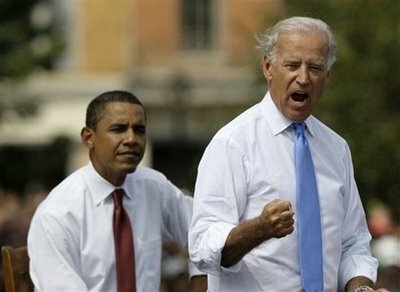 But Joe, these were your own words! Joe! Joe! Say it ain’t so, Joe! Wow! Oh well. And here I thought we were a nation of patriots. I guess not. 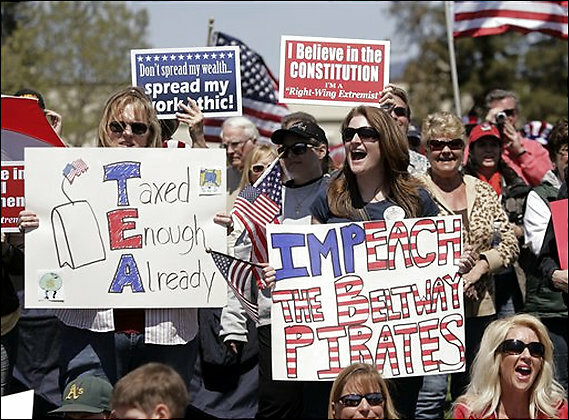 I guess we’re all just a bunch of unpatriotic, racist, extremist, tea-bagging traitors. And if you disagree with me, then you must be one too. Hey, This Universal Healthcare Thing is a Big F*ing Deal! Yes, Mr. Vice-President, it is a big f*ing deal! Shredding the Constitution always is. 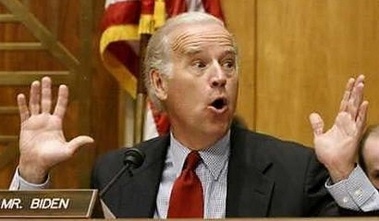 Joe Biden is of course a buffoon, and he might even be slightly crazy. 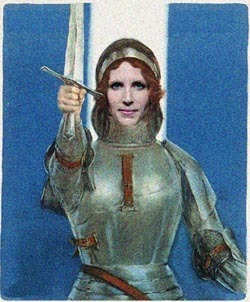 (Boy-oh-boy, we sure are lucky we didn’t end up with that loose cannon Sarah Palin!) But every now and then, in his own inimitable way, he says something that is on the mark. The latest gaffe — dropping the F-bomb on an open microphone during the healthcare bill signing ceremony — being a case in point and, in this writer’s humble opinion, an understatement. But you probably know my views on the healthcare law by now. 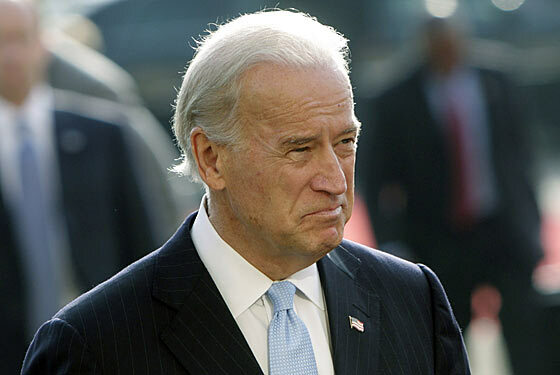 1 For the present discussion, I want to focus on the illustrious Mr. Biden. 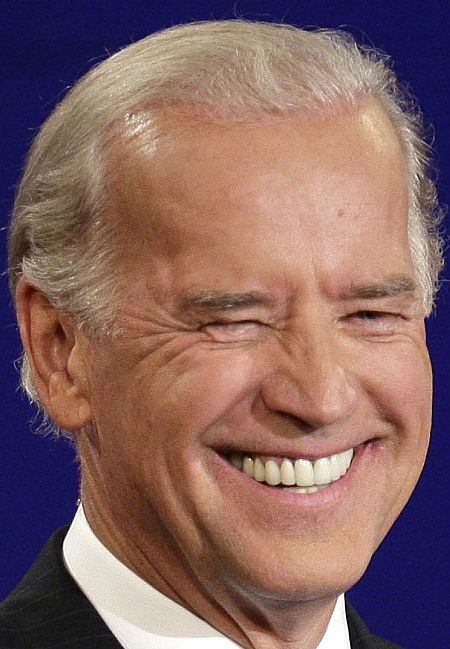 The temptation is to write off old Joe as the crazy but affable uncle of the Obama administration who they keep locked up in the attic of the White House (or in the cellar, if you prefer) and only let out when they have to—for special ceremonies and such. 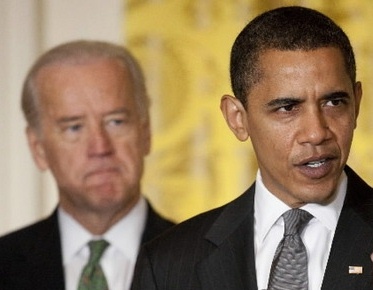 And even on these occasions it almost always looks like Obama is actually on the verge of tackling Biden before he blurts out some hellishly embarrassing thing in front of a live microphone. Though I have to admit that lately it seems the President has resigned himself to the Vice President’s risible verbosity. I mean, what can he do but laugh it off and hope no one is paying that much attention. And of course the Government Information Ministry, formerly known as the mainstream media, is more than happy to laugh along with the President over Joe’s gaffes as though it’s all a big joke and we needn’t worry that he’s only a heartbeat away from running the country. So there is this temptation, encouraged by the media, to say, “Well, it’s just Biden being Biden” and to ignore whatever he has to say. And make no mistake; a lot of what he does say is indeed rambling nonsense. But bear in mind, he sits in on all national security briefings and other top level meetings with the President and the Cabinet. He obviously has the highest level security clearance which gives him access to all sorts of classified information. (I mean, he has to have that right?) And after all, he is next in line to be President if, God forbid, anything should happen! So one has to think that he knows about stuff, lots of stuff, and that he has known about it for a long time, going all the way back to the days of the 2008 campaign. So what exactly was Joe, the humble foreign policy expert, talking about? 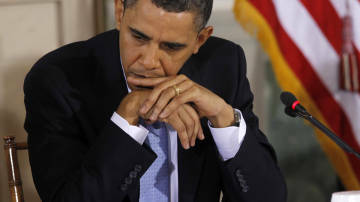 What did the Obama people confide in him was going to happen? What kind of test? JFK had to deal with the Cuban Missile Crisis which brought the world to the brink of nuclear annihilation. Is that what he meant? 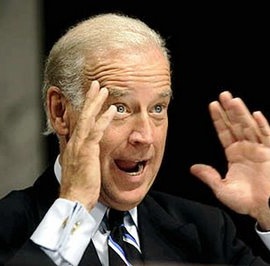 Just what kinds of decisions were going to be coming down that would make folks say “Whoa… I don’t know about that decision!” Liberals (nervous liberals especially) will conveniently dismiss this as Biden just opening his big mouth. 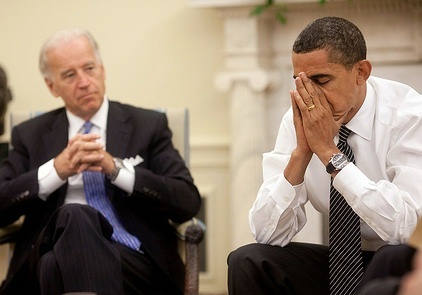 But I think Biden gave us a brief, rare glimpse into the inner sanctum here. He opened up a small window into the mind of this administration when it was in its infancy, sensing that victory was at hand and planning about all the fundamentally transforming things they were going to do, both domestically and on the international scene. And Biden was like a new convert who had just come out of a revival meeting, having heard the true Progressive Gospel for the first time; and he just couldn’t wait to spread the word, to tell everybody what he knows. While this administration has seen its challenges in the international arena, a catastrophe of the magnitude that Mr. Biden was suggesting has yet to materialize. There have been no Cuban Missile-size crises or 9-11’s to deal with. 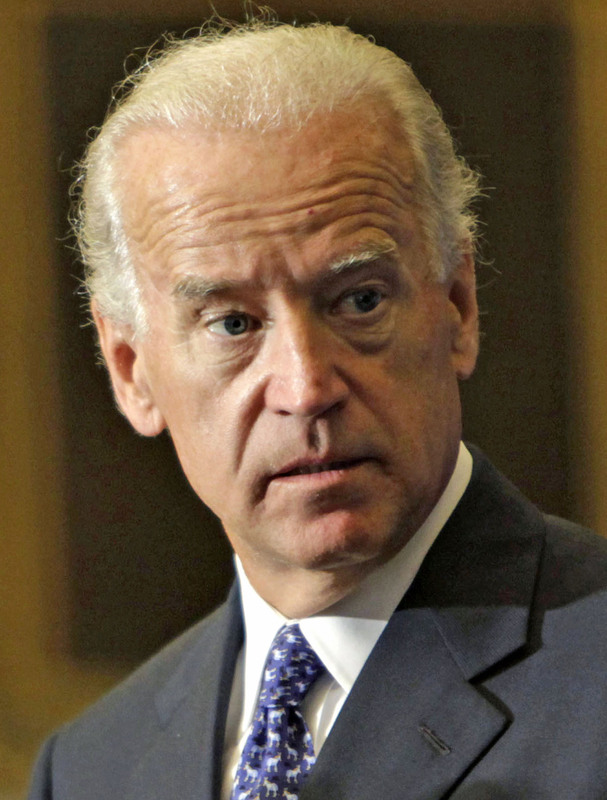 So Biden’s prognostications as to timing have been wrong… so far. However, just about every week it seems like there is some new big f*ing deal. Some new push. Some new peeling away of the onion. Some new chipping away at the foundation. Gradually, the curtain is being pulled back on this President and his administration to reveal the inner-workings of the machine; the levers and pulleys of the mechanism of fundamental transformation. But none of these things rise to the level of actual crises. Certainly none have been “generated” by our enemies. They don’t even come from someplace else in the world. Rather, they are ginned up right here, at home, by this President and his administration. 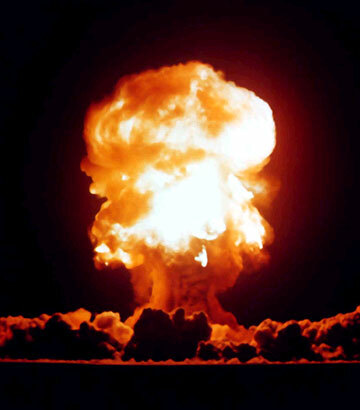 For example just this past week, the Obama administration announced a new nuclear policy for the country. For the first time, we unilaterally and preemptively have said to the world that we are fundamentally altering our policy as to when and against whom we will and will not use our nuclear arsenal. In particular, the new policy actually allows certain nations to attack us with biological and chemical weapons and we will politely refrain to retaliate with a nuclear weapon. Without here debating the merits or recklessness of such a decision (i.e., whether or not our existing or potential enemies will be inspired to follow suit or actually emboldened to press an advantage) it is beyond dispute that such a move is unprecedented in the history of American nuclear security policy. In fact, it is a radical change in that policy. It is a meddling with something that does not cry out for meddling with, indeed, something that has stood us in good stead for some sixty odd years. And yet, this decision follows a pattern and formula that has become the hallmark of this administration. That being: fundamental change, for its own sake. Fundamental change, based on an intellectual argument. Fundamental change, whether you like it or not. 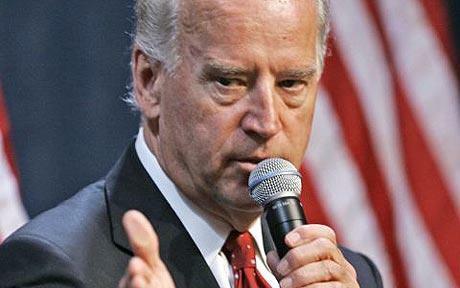 So again, what was Joe Biden talking about? What kind of long range plans and schemes did the Obama people let him in on (before it dawned on them they were talking to Joe Biden.) Did he hear something but misinterpret it? There is certainly a high likelihood of that! Maybe he got the “test” part right but mixed up the antagonists. Just who is testing whom here? Is it this President who, like John Kennedy, is being tested by the world? Or is it perhaps the other way around? We could ask Joe Biden, but he’d probably honestly say he doesn’t remember. Recently, a piece of tripe appeared on the New York Times editorial page (shocking!) about what wonderful shape the United States is in. It was written by some English wanker by the name of Piers Brendon who fancies himself a student of history. The study of history is the best medicine for a sick mind; for in history you have a record of the infinite variety of human experience plainly set out for all to see: and in that record you can find for yourself and your country both examples and warnings: fine things to take as models, base things, rotten through and through, to avoid. I hope my passion for [my country’s] past has not impaired my judgment; for I do honestly believe that no country has ever been greater and purer than ours or richer in good citizens and noble deeds; none has been free for so many generations from the vices of avarice and luxury; nowhere have thrift and plain living been for so long held in such esteem. Indeed, poverty with us went hand in hand with contentment. Of late years wealth has made us greedy, and self-indulgence has brought us, through every form of sensual excess, to be, if I may so put it, in love with death both individual and collective. He is the distinguished college professor seated at the head of his class. Today’s subject: universal healthcare. He calls on his students one by one. Have they done their homework? Have they completed the assignment to his satisfaction? Did they come to class prepared with the answers that he wants to hear? He calls on Johnny McCain who inappropriately raises the issue of unequal treatment of citizens under the proposed law. The professor summarily scolds him, reminding him that the campaign is now over. As an upperclassman, Johnny should know better than to revert to mere talking points! Then there is little Eric Cantor who had the temerity to bring the 2700 page assignment with him to class. He needs to be scolded too. Ostentatious props like that are uncalled for and serve only to distract from the intellectual discussion. Then there is naughty Paul Ryan who just didn’t have his facts right. The professor will need to speak with him after class. Alas, it would appear that at least some of his students are very delinquent indeed! But then there are his honor students: Joey Biden, Harry Reid, and of course teacher’s pet Nancy Pelosi. They all followed the professor’s instructions implicitly and so get to go to the head of the class. Well if there is nothing further, class dismissed! Now the professor, with the able help of his honor students, can return to his treatise on universal healthcare and the reshaping of American culture and society. The arrogance is nothing new; only it was on full display at last week’s healthcare summit. Americans who had the weekday leisure hours (and infinite patience) to tune in saw in microcosm the raw conceit that is the defining quality of this administration’s approach, not just to the healthcare, but every policy debate. Perhaps the campaign trail is where he first learned he could get away with it, and indeed he did. Being derisive of conservatives and conservative ideas will always win you points with the broad-minded liberal media. But it is much more than that. Arrogance towards opposing ideas and derision towards those who stand in opposition is really what Progressive Liberalism is all about. “If you disagree with me, it is because you are stupid.” That is the basic mindset. “And because you are stupid, I don’t need to listen to you, you need only do as I say.” When his healthcare plan is rejected by two-thirds of the American public, it is not because it is a bad idea, but because the ignorant masses are just too dumb to understand it. So he will try to explain it in simpler terms so that they can understand it. And if they still don’t get it, then tough sh*t! Elections have consequences. 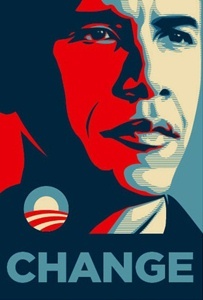 The last election was about “hope and change”, but did anyone stop to ask what that really means. Now that the campaign is over (as we are constantly reminded) apparently hope and change really mean entitlement and transformation: the entitlement of the governing elite to transform the society of the governed. This is the nature of Progressivism and, historically, has been the political approach of Progressives in America since the beginning of the twentieth century. 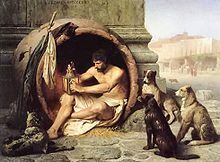 The governed are not to be listened to, but instead instructed by the governing elite in matters of health, wealth and general welfare. 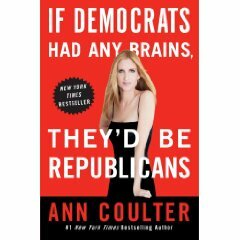 Only the governing Progressive elites, having superior education and understanding, are qualified to fathom the multifarious aspects of daily life in an increasingly complex society. It is they, therefore, who are best suited to make decisions for the average American citizen, who will only screw things up for himself. Only the Progressives are capable of brininging about much needed change through the implementation of a whole raft of government programs. And yet, none of the programs of the Progressives are based on any grasp of reality, but rather on an imagined vision of the future. It is a vision of how to change reality. A vision of a society reshaped and reordered in their image. And once power is gained, that hoped for vision becomes expectation. And the nearer the goal of the vision’s realization, the more expectation grows into entitlement. Healthcare for all is now something to which we are entitled. Healthcare is now a right. In an America where rights are still defined under the Constitution and are God-given, this line of thinking is nothing short of arrogance: the arrogance of hope. 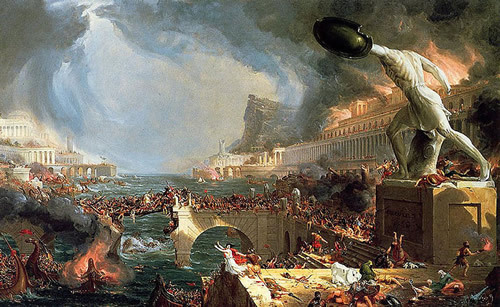 But the approach of the Progressives is not without its consequences, at least as long as we still live in a Democratic Republic. Last week, average Americans finally got a long look at their methods and, in that sense at least, the healthcare summit did some good. Regardless of how things play out over the coming weeks and months, there is always the ballot box, where Americans as voters will at last be able to send arrogance back from whence it came: the world of academia, where it doesn’t matter much.